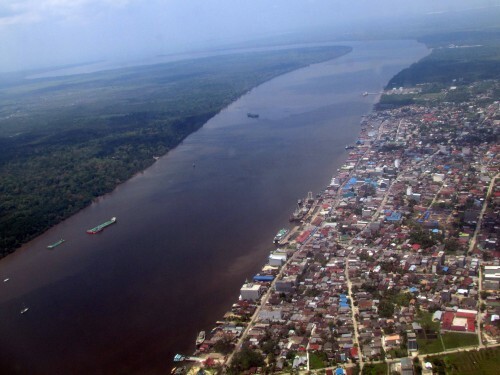 Kumai is a port city in Province of Central Kalimantan in Indonesia, on the island of Borneo.Administratively, Kumai is a kecamatan (district) of West Kotawaringin Regency. Kumai was once part of the Kutaringin Monarchy. It was originally led by Pangeran Bendahara, who later gave Kumai to Muhammad Cik, Kumai’s village leader. Cik then gave his position to Amsar, who was chosen to be regent of Kumai. Kumai was a base for Indonesian fighters attacking the Dutch and Japanese on January 14, 1946. Many soldiers died at the base, but it was maintained. To commemorate the battle, the government built a monument at the Taman Bahagia Park in Sungai Tendang, and on every January 14, people celebrate in the park to remember Kumai’s soldiers. The Kobar regent always attends. (Nowadays the monument is moved to Pangkalan Bun). The motto of Kumai is “Beriman,” which is an acronym of Bersih (clean), Indah (beautiful), Ramah (sociable) and Aman (peaceful). The motto itself is generally translated as “Religious”. Roads throughout the district vary from dirt to asphalt, but remain adequate. Residents often rent a car or “mikrolet” to travel between towns. Much transportation takes place on the river. The dock at Panglima Oetar port is the hub for inter-island sea transportation, and is where imports and exports enter and leave the district. Other ports include the CPO and Ferry ports in Sungai Tempenek. Goods and people are also transported on various rivers throughout the district. Electricity services are dispersed throughout the region, and while many residents drink water from rivers and wells, there is also a drinking water distribution company: PDAM. Kumai has total area about 2.921,00 km². On the north side, the Kumi is adjacent to the Arut Utara district. Seruyan regency is to the East, Java Sea to the South, and Arut Selatan to the West. The northern region of the Kumai District consists mostly of fertile plains. The center and southern regions are wetter, and are made up of bogs, lakes, and other various bodies of water. There are two seasons in Kumai, namely the dry and rainy seasons. The temperature averages about 20 to 30 degrees Celsius, and the mount inclination is about 0 to 100 m and 0 to 80%. Kumai District is the largest district in the West Kotawaringin regency, and is divided into three sub-districts: Kumai, Pangkalan Lada, and Pangkalan Banteng. Each district is about 4.456 km². There are 39,086 people living in Kumai. Kumai has 155 RTs (neighborhood administrative units), and 23 RWs (residence administrative units). The capital of Kumai District is Kumai. It is divided into three sub-districts and fourteen regions. The sub districts are Kumai Hulu, Kumai Hilir and Candi. The regions are Sei. Cabang, Teluk Pulai, Sei. Sekonyer, Batu Belaman, Pangkalan Satu, Kubu, Sei. Bakau, Sei. Bedaun, Teluk Bogam, Keraya, Sebuai, Sei. Kapitan, and Bumiharjo. The capital of the Pangkalan Lada district is Pandu Senjaya. The district was initially proposed as a center for Kumai, covering seven counties (Makarti Jaya, Pangkalan Lada, Pandu Senjaya, Lada Mandala Jaya, Sumber Agung, Sungai Rangit Jaya and Purba Sari). Karang Mulya is the capital of Pangkalan Banteng District (ex Natai Kerbau SP 4). It is the easternmost district and covers eight counties (Desa Mulya Jadi, Pangkalan Banteng, Karang Mulya, Marga Mulya, Arga Mulya, Amin Jaya, Sido Mulya and Kebun Agung). The majority of the people are Malay and Banjarese. The others are Madurese, Javanese, Bugis, Sundanese, Dayak, Chinese, java and some foreign citizens (volunteers, researchers and tourists). The majority of the people are Muslim (85%). Others are Hindu, Buddhist, and Christian (Protestant and Catholic). There are 33 Muslim mosques in the Kumai District, 83 small mosques, three churches and one other house of worship. Kumai Language (Coastal Language) is the daily language of Kumai. It bears similarities to Banjar language because some of the residents originated from Banjar. Being a port city and host to many immigrants, the languages in Kumai are highly varied. Kumai Residents have various occupations. In general they work as fishermen, but some also work as farmers, PNS (Public Civil Servants), ABRI, traders, animal breeders, miners, or private employees in companies that harvest oil palm and/or coconut. Tirik is a form of poetry popular in the Kumai Hulu District. Music and dance is central to the culture of the Kumai District. Hadrah is a form of Islamic music that uses rebana. Japin is a traditional dance of the Melayu people that is still performed in the district of Candi. Several annual festivals dot the local calendar as well. The Bebersih Benua (literally “cleaning continent”) is held every year by local fishermen. Other traditional ceremonies – such as weddings, cicumcisions, etc. – are usually held in Kumai.